Etosha Fishing Corporation won four of the five large enterprise categories at the 5th Annual National Quality Awards hosted by the Namibian Standards Institution (NSI) in November, scooping up Company of the Year, Exporter of the Year and Product of the Year. Etosha Fishing Quality Manager Linekela Kapundja also received the Individual Award for Quality. In 2015 Etosha Fishing managed the same feat by winning all four categories, going on to win Company of the Year and Exporter of the Year at the 2014/15 SADC Quality Awards. With this achievement the company will once again pit itself against other winners from the SADC Region at the next annual SADC Quality Awards. “We are absolutely delighted to once again receive recognition for our efforts to ensure quality in all we do,” says Etosha Fishing MD Pieter Greeff. The company has shown consistent results in the Quality Awards since 2013 when it came second in the Large Enterprise Quality Award category, going on to win the large enterprise Quality Award, Exporter of the Year and individual Quality Award in 2014. The NSI Quality Awards programme was introduced in 2012 with the aim of honouring companies who contribute to quality advancement in all sectors of the Namibian economy by having measurements and quality systems, procedures and processes in place that are in line with local, regional and international practices. The programme also recognizes companies who use quality advancement to support national economic development and growth. Etosha Fishing is a leading player in the Namibian fishing industry and operates in a business environment where its customers are the market leaders in the canned pilchard industry on the sub-continent, including the revered Lucky Star and Glenryck brands. Its cannery is a world leader in fish processing with advanced automated equipment unrivalled in Southern Africa. The company broke ground in 2013 with the introduction of its own EFUTA Maasbanker brand, leading the way with value addition by canning locally caught horse mackerel. This has satisfied an emerging need in the market for a good quality product alternative at a time when economic hardship has caused many consumers to move away from higher end products. The venture also allowed for a more sustainable business operation with longer term employment for more Namibians. Since the introduction of EFUTA Maasbanker to the local retail market at the start of 2014, sales volumes have increased five-fold. EFUTA Maasbanker was the first Namibian canned product to receive the NSI Standard Mark of Conformity product endorsement and proudly carries the Team Namibia logo. Along with all other canned products, EFUTA Maasbanker is Halaal certified. Etosha Fishing’s factory also carries Kosher certification by the Union of Orthodox Synagogues of South Africa. “This means that our products can be consumed by people of any culture or religion. Through these certifications our products act as ambassadors to the Namibian Manufacturing and Food Industry outside of Namibia,” says Greeff. Etosha Fishing knows that it is not a static business in a static environment. In order for the organisation to achieve sustained success, it applies a quality management approach. Critical quality aspects of the manufacturing process are managed throughout the system, from the sea to the final point of dispatch to the customer, providing the assurance that the customer can consistently expect a product of excellent quality, according to Etosha Fishing Quality Manager Linekale Kapundja. Quality Assurance Manager Linekela Kapundja (pictured right) is in charge of maintaining and improving quality management at Etosha Fishing. She scooped up the Individual Award for Quality at the NSI Quality Awards, given to an individual who has made significant input into Namibian Standards, Quality Assurance, Accreditation and Metrology efforts. 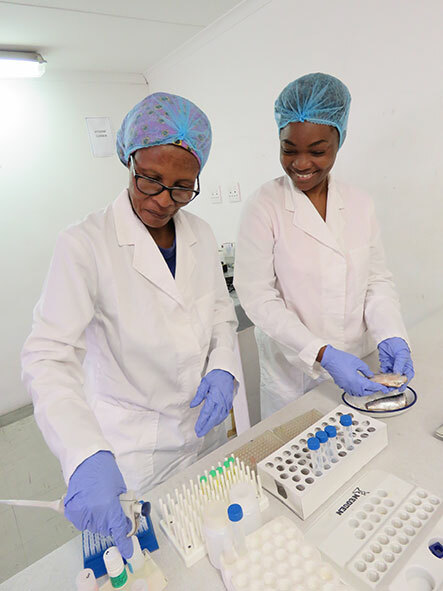 Quality Supervisor Zola Udigeng (left) is lending a hand during laboratory testing. “Our quality management system is based on the principle of ISO9001 and we use HACCP as a measure to control food safety risks. Etosha Fishing is certified to HACCP by the NSI through an inspection and audit program. All our products are also inspected by the NSI for compliance with canned food manufacturing regulations and also by the South African National Regulator for Compulsory Specifications (NRCS). We have an extensive risk management programme in place that is based on the principles of OSHAS 18001 and ISO 14000,” Kapundja elaborates. Etosha also maintains a continuous improvement program, applying priorities that are based on market trends and research data, inputs received from customer satisfaction data as well as suppliers and other interested parties. Social, environmental and economic changes are analysed to broaden the product range, achieve growth and ensure operational efficiency and sustainability. To this effect trials are currently underway to test new flavours in the EFUTA Maasbanker range, including a curry sauce and minced horse mackerel in tomato sauce, which will be available in the market as soon as the shelf life tests are completed. 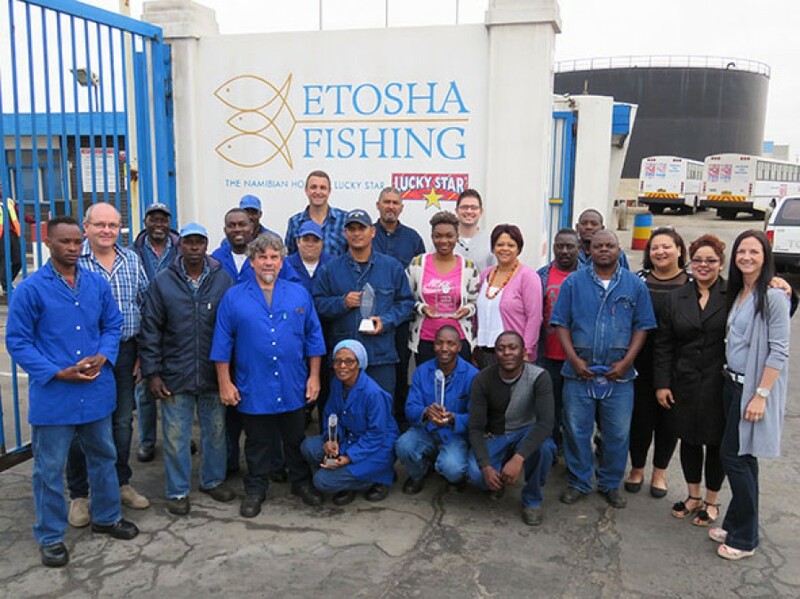 An integral part of Etosha Fishing’s quality management focus is successful employee engagement. “We engage our employees through training so that they understand the importance of producing quality products in a safe work environment,” says Greeff. He notes that employees go through quality induction training and refresher training through-out the year which involves and array of topics, including good manufacturing practices, HACCP principles, personal hygiene and basic hygiene for food handlers, quality controllers training and good laboratory practices. “On the production floor, team work is necessary to ensure product quality. Quality incidents are recorded and immediate corrective actions can be taken at shift team leader and quality supervisor level,” says Quality Manager Kapundja. All these efforts have placed Etosha Fishing products among one of the best quality canned products, not just in Namibia, but in Africa and worldwide. Significant investments have been made over the past five years to ensure improved quality and operational efficiency of the company. Highlighting just a few of the improvements, Greeff explains that the company most recently invested N$5.5 million to upgrade its thawing system in the cannery, which increased its capacity to thaw fish from 120MT per 24 hour shift to around 180MT per 24 hour shift. With Namibia’s pilchard resource under pressure for some years now, Etosha Fishing has been importing frozen pilchards for processing on local soil since 2010, which has contributed significantly to the creation and sustaining of additional local jobs despite poor pilchard catches. In addition, one of its trawler vessels, Iona, was upgraded and overhauled at a cost of N$17 million to enable Etosha Fishing to catch horse mackerel in Namibian waters. A reverse osmosis plant and can drying system was installed in its processing plant to reduce product rust due to the unsuitability of the Walvis Bay water for can cooling. This has reduced product loss due to rust by 98%. In addition the brine effluent of the reverse osmosis plant is added to the seawater treatment plant to augment supply of seawater to the cannery. As an environmentally conscious corporate citizen, the company implemented an energy management plan to reduce electricity usage. Another energy saving measure includes the installation of a new pre-heating system for boiler water based on the use of waste fish cartons as fuel, thereby reducing the fuel required for its boiler water heating.